Kadu Manga/Kadumanga Achar/Achaar is the Malayalam term for mango pickles made with cubes of fresh, tender, unripe mangoes made into a pickle by cooking the mangoes with lots of spices, such as Kadugu (Black Mustard seeds), red chili powder, Turmeric, Kaluva Podi ( Fenugreek powder), Kaayam Podi (Asafoetida powder), Vinegar and Curry leaves . 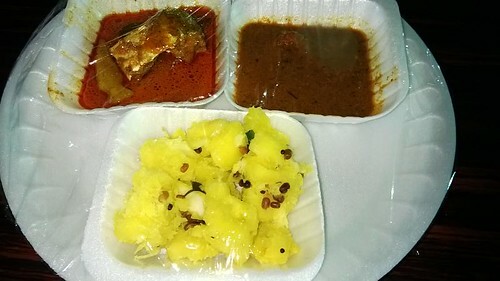 Kadu Manga or Kadumanga Achar is also called Manga Achar or Uppillittuthu in Malayalam, the language spoken in Kerala. Ready-made Pickling or Pickle Powder is also available in almost foodshops in Kerala. It is made from various spices and it is only needed to be added to the food to be pickled. This is the one which was recommended to me by my family friend to cook my own pickle when I go back to Germany. I love all pickles served to me while I was in Allepey, Kerala, but my favorite is Kadu Manga Achar. 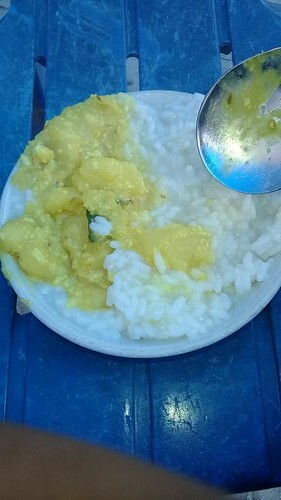 It will always bring back happy memories, since it is one foods served to me on my first lunch with my second family in Allepey. This is my very own version of Kadu Manga Achar using the Pickle powder I brought home from Allepey, Kerala, India and the Philippines variety of Raw /green Mango. 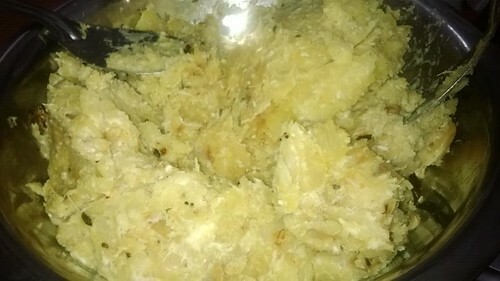 Kappioka/Kappiokka/Kappa Varuthath/Varuthathu refers to Indian savory snacks made from Cassava. 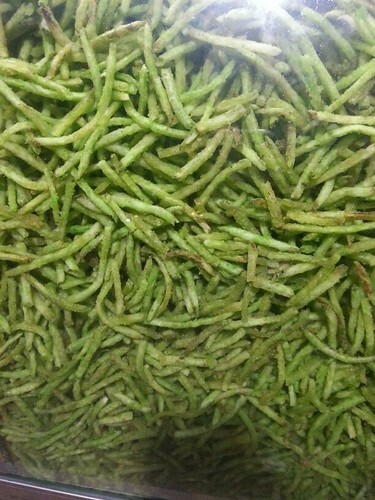 They are formed like noodles and flavored with different spices, such as Masala powder and Curry leaves . They are also cooked as sweet snacks by adding sugar or Jaggery to the noodle-like snacks. They are deep-fried in Coconut Oil that make these snacks more delicious and tasty. 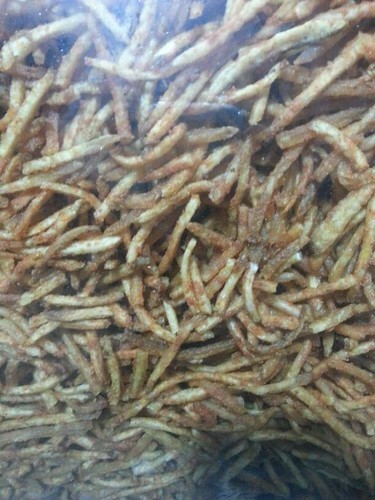 Noodle-like sweet and savory snacks are popular in India. They are also added to a savory mixture of nuts and Sev called "Mixture" in Kerala, India. Here are the pictures of 2 kinds of Kappioka/Kappa Varuthath/Varuthathu which were one of the many sweet and savory snacks sold during Christmas midnight masses held in many churches in Kerala, India. Kozhikodan Halwa also spelled Halva are sweets from Kozhikode or Calicut, Kerala, India where the most special and delicious Halwas are made in the state of Kerala. There is a street in Kozhikode named SM Street , Sweet Meat Street called Mithai Theruvu in Malayalam, the name given by European traders because of the many shops lined up on the streets selling Kozhikodan Halwa which they called as Sweet Meat . In the past, this historic street was the busiest shopping and commercial center at the heart of Kozhikode and today the street is still busy with many shops that sell anything and everything including the famed Halwa, Banana Chips (Upperi) and other. 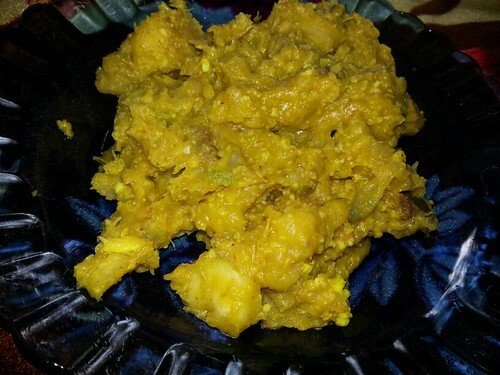 Below is a picture of Kozhikodan Halwa/Halva from Kozhikode (Calicut), Kerala, India. I was blessed to have tasted these different flavors of Halwa from this historic street. Very delicious. I will never get tired eating Halwa, my favorite is always the black one, which I have tasted in Allepey, Kerala, India during a festival . 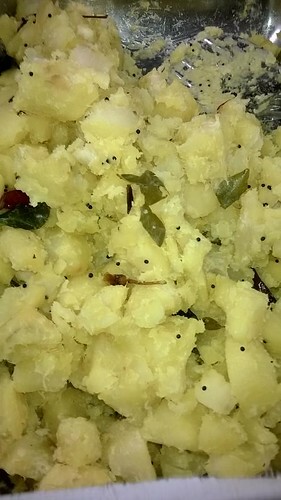 Kappa Puzhukku refers to one of the dishes from Kerala, India made from boiled/teameed mashed Cassava seasoned with different spices, such as Black Mustard seeds (called Kadugu in Malayalam) and Curry leaves and then served or paired with Pachadi, Beef Masala or other dishes like Erachi Olarthiyathu, or Curries. Below are pictures of Kappa Puzhukku from various places I visited in Allepey, Kerala, India. 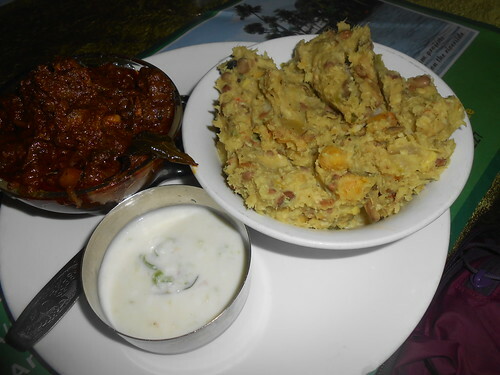 The picture below is the first and the tastiest Kappa Puzhukku I ever tasted in Kerala, India. One of the dishes, recommended to me when I visited Avees Restaurant. It is the restaurant's house specialty. In these pictures below, Chappati is being prepared to make Katti Chappati. 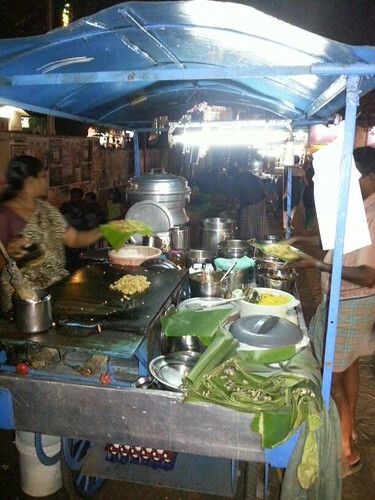 It is one of the street foods being sold in Coimbatore, Tamil Nadu, India during the daily night food market in one of the busy streets of saif city. 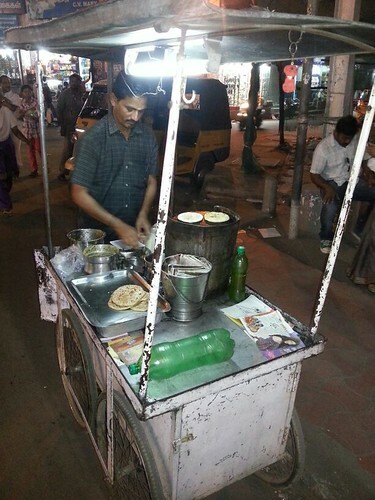 The street vendor is operating his Thattukada, which is a roadside or street eatery, fast food outlet or hawker food. Some mobile or rolling Thattukada are mostly operating only in the night in Allepey Beach in Allepey, Kerala. 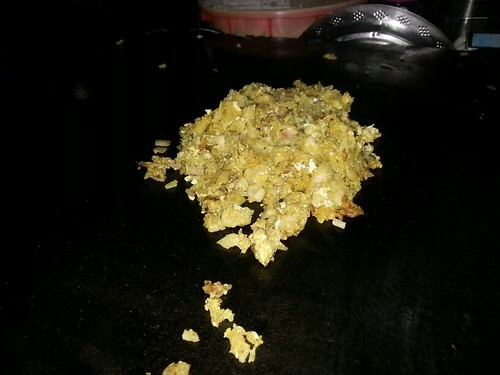 Kothu Porotta/Parotta refers to South Indian spiced Porotta (flat bread) which is made by tearing the Porotta into small pieces and then sautee these pieces of bread with slices of onions, scrambled eggs, chicken or mutton gravies and Masala powder. Coimbatore is the second largest city and district in the South Indian state of Tamil Nadu. 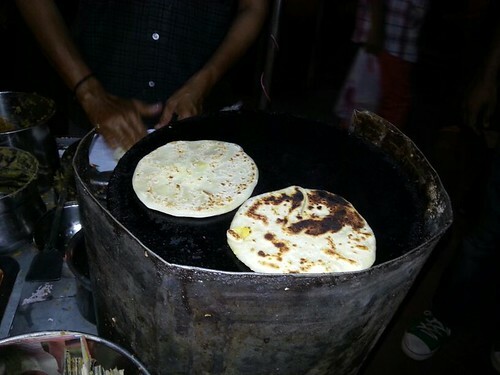 Below is a close-up view of Kothu Porotta/Parotta which is sold as night street food in one of the busy streets in Coimbatore and the street vendor using a mobile store to sell Kothu Porotta/Parotta that is serve in Banana leaf.